Controversial businessman Mr Wicknell Chivayo was yesterday taken to task by the Portfolio Committee on Mines and Energy over the $5 million he received from the Zimbabwe Power Company for the Gwanda solar project without the requisite bank guarantees. A bank guarantee is given to secure advance payments made for work that has not been done.Mr Chivayo was also grilled over the manner he won the tender for the project in 2013. 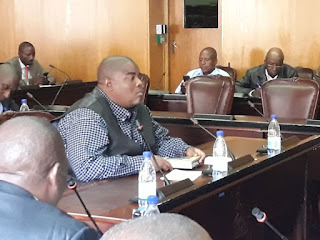 Committee chairman Mr Temba Mliswa asked Mr Chivayo to explain why there was a disparity on the amount he received from the $7 million that was mentioned by ZPC Board chairman Mr Stanley Kazhanje. “Just tell us how much you got and where the money went to. We had ZPC here and they said they gave you $7 million. Just tell us how much you got and we break it down,” Mr Mliswa said. Mr Chivayo responded: “If ZPC say they gave me $7 million then that is incorrect because the payments are clear they went into one bank account and it is very clear that the amount is $5 million. He admitted that he had been paid by the company without the bank guarantee and had sought assistance from former Minister of Energy and Power Development Dr Samuel Undenge after suspended ZPC managing director Noah Gwariro had refused to pay him the money without the guarantee. Mr Chivayo was then requested to furnish the committee with bank statements on the payments he had received so far. On the awarding of the tender in 2013, Mr Mliswa asked Mr Chivayo why he had sought recourse from former Minister Dzikamai Mavhaire when there were laid down procedures to air any grievances when contesting a tender award. “To me this is where it is all starting from that you lost the tender you went to the minister you said you are a son of the soil why can’t you give me the tender yet there is a process which should be used when in appealing if you are not happy and you said there is a court process and members are still asking if there is process why didn’t you use that court process,” Mr Mliswa asked. Mr Chivayo said he approached the former minister since he thought the award to the Chinese company was unfair given that he had brought the idea for the solar project to Government. He said his company had also met the technical and funding requirements of the project. The committee also accused Mr Chivayo of using his proximity to the former First Family especially the former First Lady Grace Mugabe to get the tender. He refuted the allegation saying they were not involved in his businesses. Meanwhile, Mr Chivayo’s business partner Mr Youssef Ahmed’s lawyer Bruce Tokwe told the committee that Mr Chivayo had ceded shareholding in the company in 2014. “I wish to highlight to you members that in 2014 Mr Chivayo borrowed some money on the understanding that he would cede the rest of his shareholding in Intratek which he did to a company called Intermureal Investments,” Mr Tokwe said. He added that Mr Chivayo was currently employed as the managing director of the company. ZPC Acting Managing Director Mr Joshua Chirukutsi, who also appeared before the committee, contradicted Mr Kazhanje saying Intratek had been given $5,1 million including taxes not $7 million. Mr Chirukutsi and his management were, however, ejected from the meeting after failing to respond to a question on who had directed them to pay Mr Chivayo without the bank guarantee.